West Valley City » Martha Robles had heard about In-N-Out Burger, but she had never tasted its famous cheeseburger until Tuesday. "It's delicious ... and juicy," said the West Valley City resident sitting with her three sons at the Valley Fair Mall store. 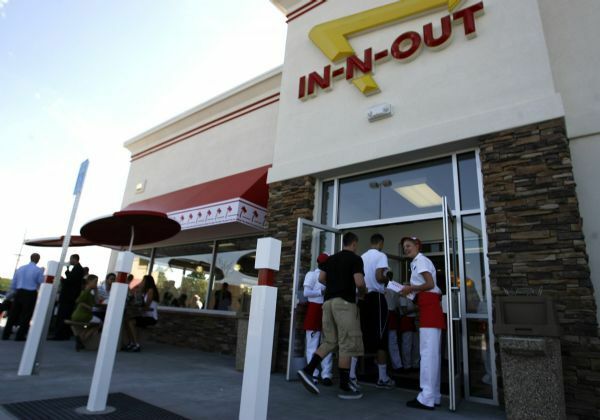 Two new In-N-Out Burger joints open today in West Valley City and Riverton, bringing the total number of stores along the Wasatch Front to six. A location in Centerville is scheduled to be open in the fall. Robles was one of hundreds of employee relatives, businesspeople and West Valley City officials who were invited to a free dinner at a special event Tuesday -- on the eve of the store's grand opening. The West Valley City store is the closest location to Salt Lake City -- nine miles from downtown. 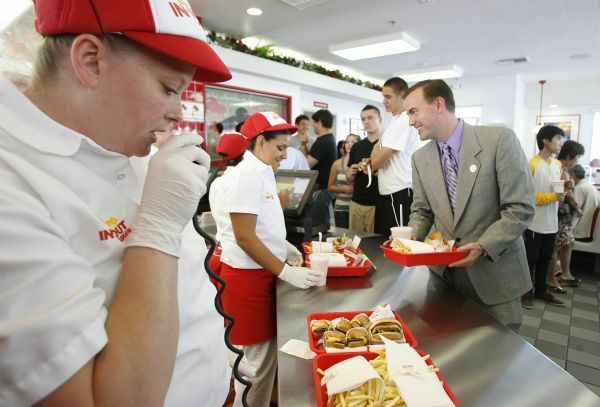 And it's too early to say if, or when, a store might open in Salt Lake City, said In-N-Out Development Vice President Carl Van Fleet. Many people, from city officials to West Valley residents, said they're excited about having the burger joint in their town and expect it to improve the city's status. "It's going to give West Valley a better vibe," said In-N-Out employee David, a 2010 Granger High School alum preparing to head to Weber State University soon. The West Valley store hired 60 people; 50 in Riverton. Wages start at $10 an hour, Van Fleet said. West Valley City Manager Wayne Pyle said fast-food joints aren't big revenue sources for the city, but the businesses are crucial to drawing people from outside West Valley to the city to spend money. 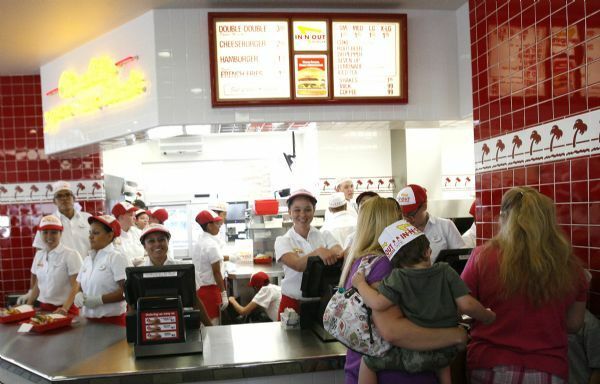 In-N-Out is "popular" and will be "a positive" impact on the city's image, he said. "If it attracts people to our shopping district, it's great," Pyle said in line to order a cheeseburger. Councilman Corey Rushton said the mall renovation, including the In-N-Out, near City Hall are part of the city's vision to have a bustling City Center. Gary Hall, vice president of Satterfield Helm Management, a Sandy-based developer that bought the mall three years ago, agreed. "It grants a lot of credibility to the vision of the mall and West Valley City," he said. The mall's roughly $85 million redevelopment plan has included several chain store and restaurant openings in the last year -- Petco opened this month and Ross is expected to open in September, Hall said. 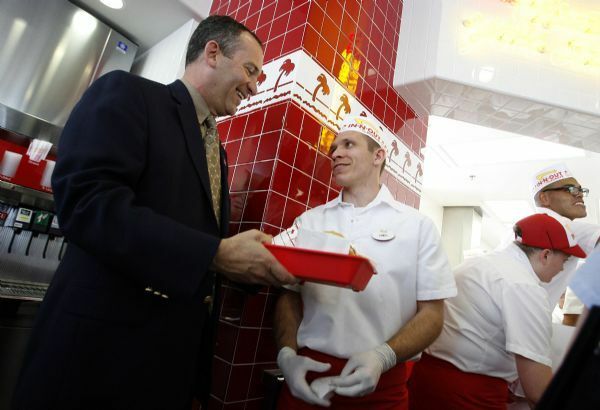 Satterfield started negotiating with In-N-Out two years ago, he said. For Phoenix Hudson, a Taylorsville High School senior, In-N-Out has been the best first job she could ask for. She works at the West Jordan store but will be transferring to the one in West Valley, her home. She enjoys the perks of a free burger when she works and managers accommodating her busy school schedule. "I hear how kids hate their jobs, but I love my job." she said. * 3715 S. Constitution Blvd., Valley Fair Mall, West Valley City. * 12569 S. Crossing Drive, Riverton. * Other locations include American Fork, Draper, Orem, West Jordan and Washington City. Hours: 10:30 a.m. to 1 a.m. Sunday through Thursday and until 1:30 a.m. Friday and Saturday.